A tradition of building rectangular homes naturally leads to a rectilinear or near-rectilinear city form. So what do round houses lead to? Well, they often lead to a cluster arrangement. 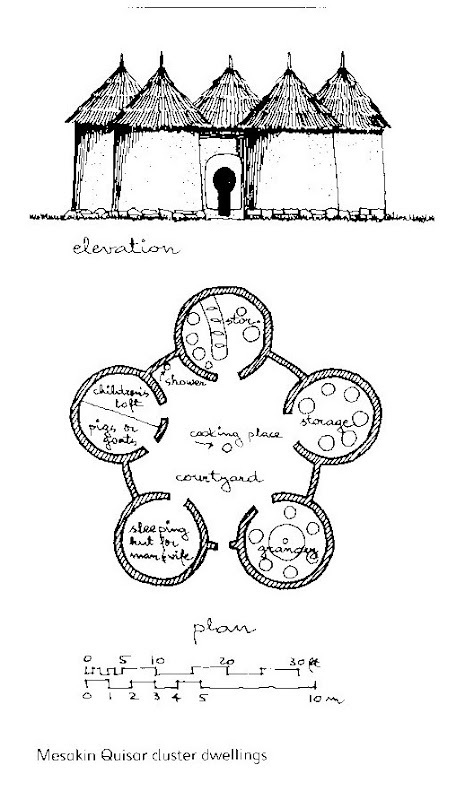 An interesting case is the Mesakin Quisar dwelling of the Nuba people in Sudan. 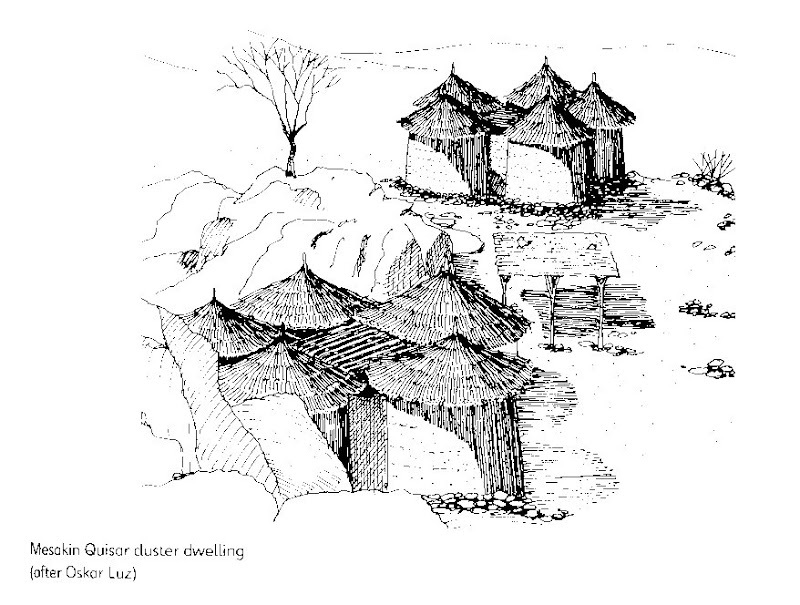 The typical Mesakin house comprises five or six round mud huts around a courtyard. The huts of about 11’ to 13’ in diameter (3.3 to 4.0meters) with a conical grass roof. The huts have no windows and only a small oval doorway to let in light and air, but this keeps the interior cool against the outside heat. The entrance to the courtyard has a keyhole shape: the larger opening at the top lets pass a person carrying a bulky load on her head. The coutyard is where cooking, eating and most social activities take place. In a corner between two huts is a rudimentary shower – the bather has to tilt a container cradled on antelop horns co that water can trikle from a hole near the rim. The huts serve as stores or sleeping areas or as pens for pigs or goats. Often the children sleep on a loft above animals. The internal walls of the Mesakin huts as well as the inside of walls between them are glazed shiny-blue by splashing the walls with earth that contains graphite and then hand-rubbing it. Apart from the ornamental effect, this hardens the wall material and makes it smooth. The Mesakin are polygamous. 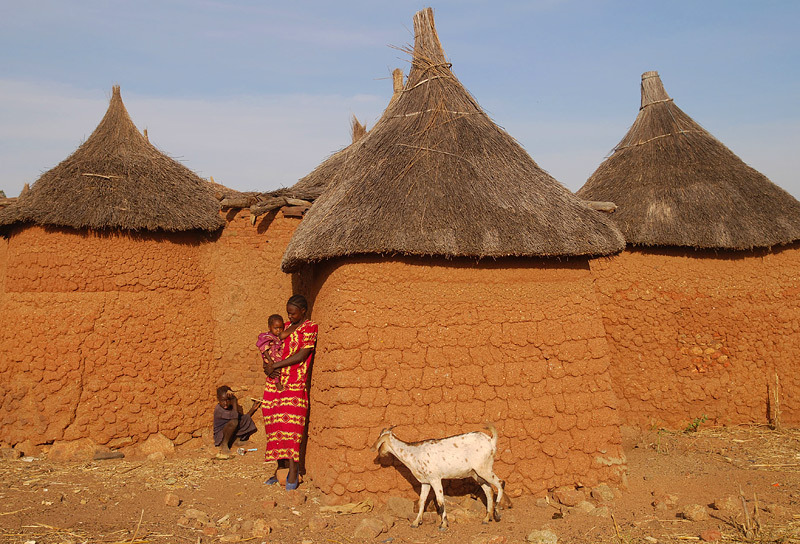 Husbands provide their wives with separate dwellings for each as well as livestock and additional fields. These separate dwellings are spaced out, not clustered. Round huts, round compounds, but no round villages! This is great, Now I can live in round huts, round houses, round towns, round cities, round countries & have a round lake near by! All on a Round Earth! The kids sleep with the pigs and goats? So he has to build a separate house for every wife? Got a package at the Post Office! Going to pick it up today! Yippy!